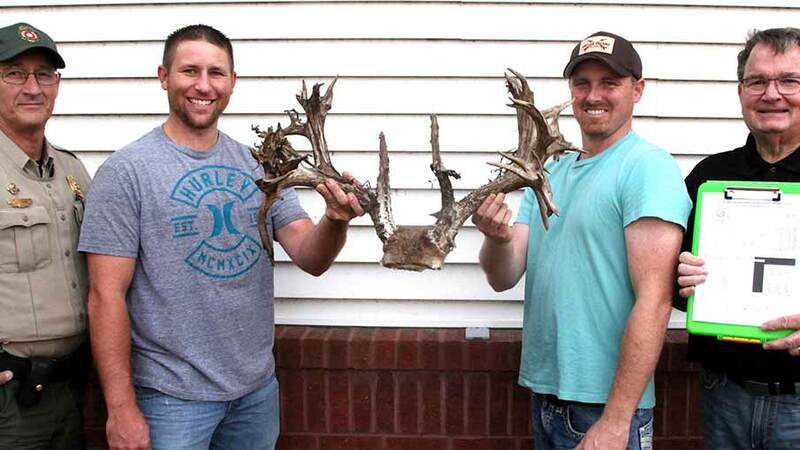 Josh Hughes and Drake Fletcher looked in astonishment at the mummified deer corpse, a dead whitetail that was hanging by its massive and tangled antlers in a creek-crossing fence that was on their neighbor’s property. Instantly, they knew it was a monster buck that they had been watching and hunting for several years, a Goliath-buck if you will. 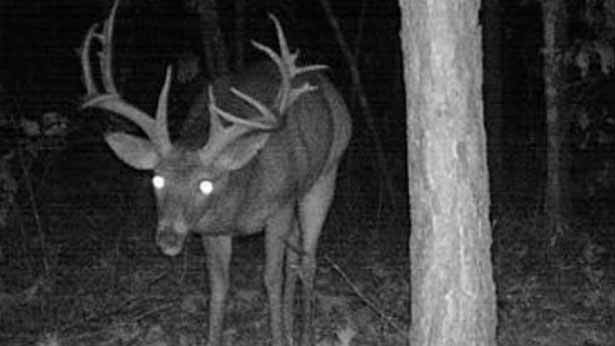 Trail camera photos - and an eventual scoring session by official Boone and Crockett Club measurer George Moore – would confirm that the buck was a world class giant thanks to its green scores of 269 2⁄8-inches gross and 259 6⁄8-inches net. 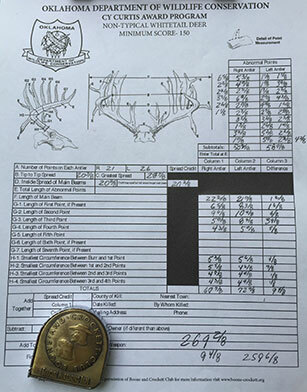 If that final number of 259 6⁄8-inches stands up after the 60-day drying period is over, the buck stands poised to possibly become the new Oklahoma state record non-typical whitetail. That’s amazing for a buck – with 21 pointson one side, 26-points on the other, and an estimated age of 6 ½ years – that had been roaming their nearby hunting land over the course of itssix-plus years long lifespan. The 2017 Thanksgiving weekend for these two Oklahoma sportsmen would take on even more meaning this particular whitetail season because these young men would be tested, even tempted. That is where this story really takes a special turn for this particular Oklahoma Department of Wildlife Conservation Game Warden of 38-years. In my profession, like I guess almost all other police officers do in our society, wardens must confront the very worst of our group. Some commit shameful, even unspeakable crimes against man and nature. Over the years, there have been too many showdowns to count, having to expose lies, extract confessions, and then often grinding through the ensuing legal challenges that can often follow. All of that can wear a man down. But then along comes such an experience as I recently had with these two sportsmen and the massive 47-point buck that they discovered. I realize we're all fallible, and certainly, we’ve all made mistakes and had regrets in the outdoors world. Questions like “Why did I shoot?” or “Why didn’t I shoot?” or, “How did that happen?” or even “What the heck just happened?” can all arise. These are all questions we may have at one time or another in the outdoors, things that we have asked ourselves. Because when we’re standing alone in the outdoors, we haven’t the luxury of coaches, fans, teammates, or even referees to help guide us in our every choice - it's all on us. 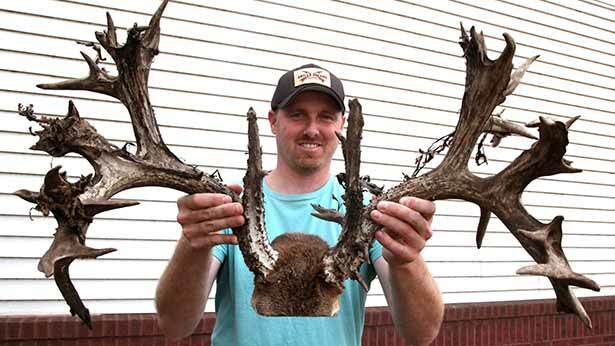 non-typical found recently in Le Flore County. become the Sooner State’s new non-typical record. So oftentimes, many times in fact, and due to the weakness of human behavior, bad decisions are made by many. Over my decades of teaching hunter education classes, I’ve preached to thousands of youngsters. Yes, preached, as I've stressed to those still awake and actually listening, about how they'll be judged by their actions in everything they do and by the company they keep. That they will be evaluated as representatives of their family name, ethnic group, school, community, state and any other subgroup that they've found themselves associated with. And it's in some of those most challenging moments of decision making outdoors that your character will be defined and revealed. These two young men, Hughes and Fletcher, would have their very ethics tested recently by the discovery of this huge 47-point buck, though not because of the act of hunting. It is because such a buck can be followed by the typical controversy and innuendo that goes hand in hand when hunters come into possession of such world-class deer. These two men, both conservation-minded and college educated classmates from a nearby wildlife college in eastern Oklahoma, contemplated, and then understood, that this was such a moment for them. So many other type decisions could have been made on how to respond to such a challenge and temptation when they found this giant buck. But they were ‘raised right', so to speak, and knew that this animal was special. He was unique and deserved reverence. Not to be simply treated as a thing to be possessed, something to covet because it was an item of possible high dollar value. As true sportsmen, and by legal definition in the state of Oklahoma, these men knew the deer was not theirs since it was not lawfully harvested through hunting. And even though the 47-point mammoth whitetail could possibly be a new Oklahoma state record, the buck should forever belong to the sportsmen of Oklahoma and not to any one person. Because of that, the "Hughes-Fletcher Buck" is getting mounted for public display and discussions are underway that hold the possibility of replicas being produced for these two men. If I were a sailboat floating motionless on glassy waters, you just heard my sails go Pop! when this big gust of wind filled my furls! I hope it encourages you too, because these two young men understand the meaning of the word conservation and what being a conservationist really is. They obviously stayed awake in their hunter education class and now sit at the head of the sportsman class in my book. And, if these two young men turned out so well, then perhaps there are others like them out there .. .and that should be encouraging to all of us. I understand that Josh Hughes operates his own quality habitat and land management business, an operation called "Whitetail Unlimited". If you're ever in need of quality deer management advice, well, let’s just say that I know a couple of young men out there that I'd be willing to say you can trust them for such advice. All because of how they handled a world-class buck in Oklahoma. Like game warden stories? Watch “Wardens” on Outdoor Channel. You also can watch past episodes of “Wardens” on MyOutdoorTV.com.